I baked these cupcakes for two friends’ farewell party. 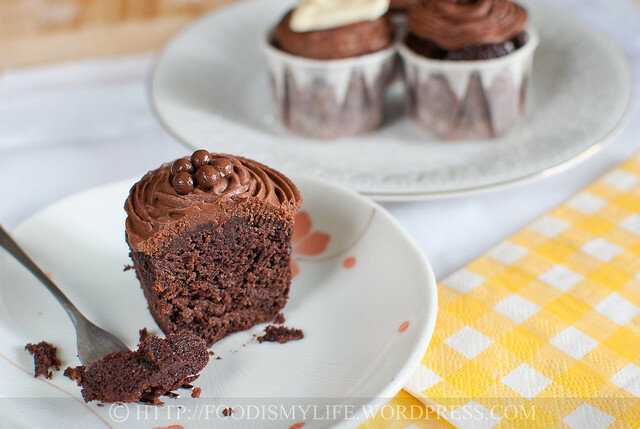 It’s an extremely easy recipe as no electric mixer is required to make these cupcakes (hooray!) The cake base is actually a boozy Baileys Chocolate Cupcakes that I’ve made before while the topping is a simple ganache, chilled until firm enough and piped onto the cupcakes. Preheat the oven to 160 degrees Celsius. Prepare the cupcake liners and set aside. Measure the plain flour, baking soda and salt in a small bowl. Whisk the mixture with a wire whisk to distribute the baking soda and salt evenly. In a small pot, measure the cocoa powder and sugar. Add in the coffee and butter. Heat the mixture on medium heat, and whisk frequently until all the butter has melted, and the cocoa powder and sugar has dissolved. Pour the cocoa-coffee into a large mixing bowl and let it rest for 10 minutes to cool down. Stir in the Baileys. Crack in one egg into the cocoa-coffee mixture and whisk it in until it has been fully incorporated. Whisk in the second egg then whisk in the vanilla extract. Sift in the flour mixture and whisk in gently until all the flour has been incorporated. The cake batter will be thin (very liquidy) and bubbly (because of the reaction between the baking soda and the cocoa powder). Fill the cupcake liners ¾ full and bake for 20 - 25 minutes until a skewer inserted into the centre of the cupcake comes out with very little crumbs. Place the cupcakes on a wire rack and let cool completely. Place the chopped chocolate in a heatproof bowl. Heat the heavy cream in a pot until almost boiling then pour it over the chopped chocolate. Leave it aside in a warm place for 3 minutes, then stir with a whisk until all chocolate has melted. Add in the Baileys and stir to combine. Leave the ganache to cool (you can speed up the process by placing it in the refrigerator) until it is thick enough to be piped. Transfer the ganache into a piping bag and pipe decoratively onto the cupcake. Decorate with chocolate pearls and serve. 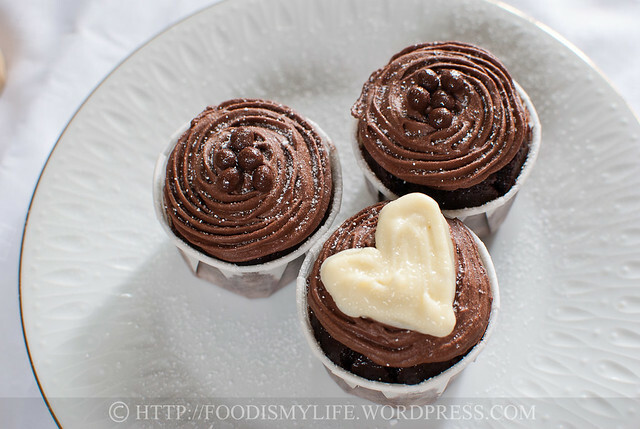 I usually test-bake one cupcake before baking the whole batch – I fill one cupcake liner 3/4 full and bake to see how tall the cupcake will rise, if it overflows, I’ll fill the cupcake lesser than 3/4 full and if it did not rise to the height I like, I would fill the cupcakes a little more. They look very moist and rich. Wow, looks so moist and delicious! I’ll polish one off too if it is in front of me! I love the frosting job (I’m trying to improve on my frosting skills so I’m always looking at everyone else’s!). 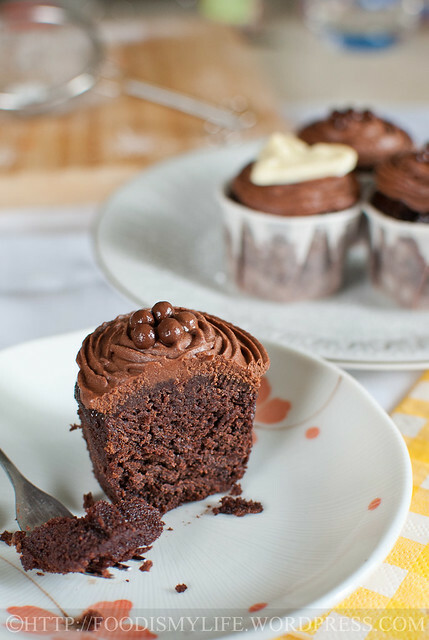 Baileys and chocolate is a winning combination – these cupcakes look dense, moist and delicious! I hope you’re having a fabulous vacation. I hope you are having a wonderful holiday. These little boozy baileys chocolate cakes look so sinful. Wow do those look good! Love Bailey’s what a great idea! Yummy post! Hope you’re having fun! And so you tempt us while you are away.. you little vixen.. these look amazing! !